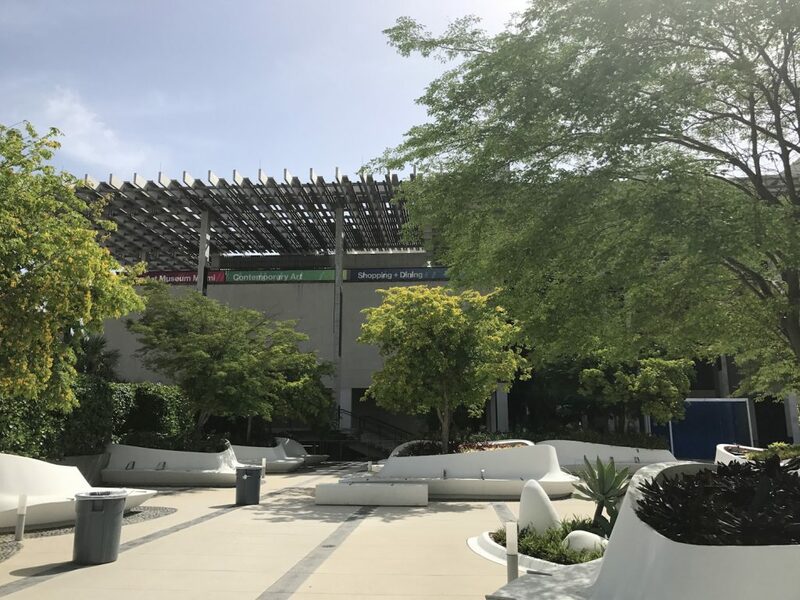 The sign was perched on top of a tiny table in a giant gallery at the Pérez Art Museum in Miami, a contemporary museum commonly referred to as PAMM. The artist was young with close-cropped reddish hair and beard, wearing a denim jumper, colorful tattoos, and Nikes. He sat on a stool, hands immersed in a small weaving project, needles and yarn splayed out. Although museums can be intimidating and cold, he exuded friendliness, so I approached. “Can I ask you a question?” I nodded in the direction of the small sign advertising his availability to answer. “Of course,” he replied, smiling. “How does this work, exactly? 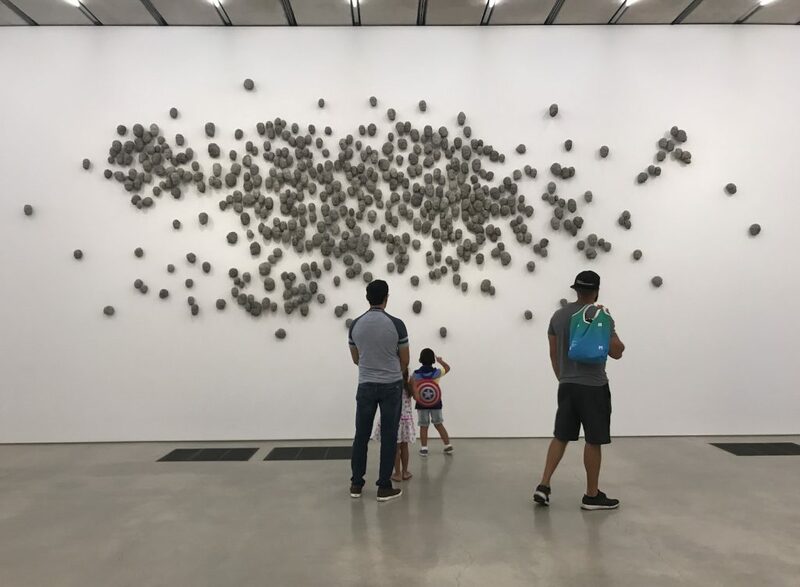 What are you doing here?” I gestured to the wide gallery with slick concrete floors and oversized works of contemporary art by Ledelle Moe, Enrique Martinez Celaya, and Yoan Capote. “Are you an artist?” I asked. My eyes grew wide at the idea of a museum employing one, let alone a whole team of fulltime self-identifying local contemporary artists. “What do you do here?” I asked. “And you all self-identify as artists here, rather than being the ‘educational coordinator’ or the ‘community outreach specialist’ or some other title?” I was shocked at his revelation that the visible presence of local working artists was seen as an asset, rather than a liability, by this particular institution. 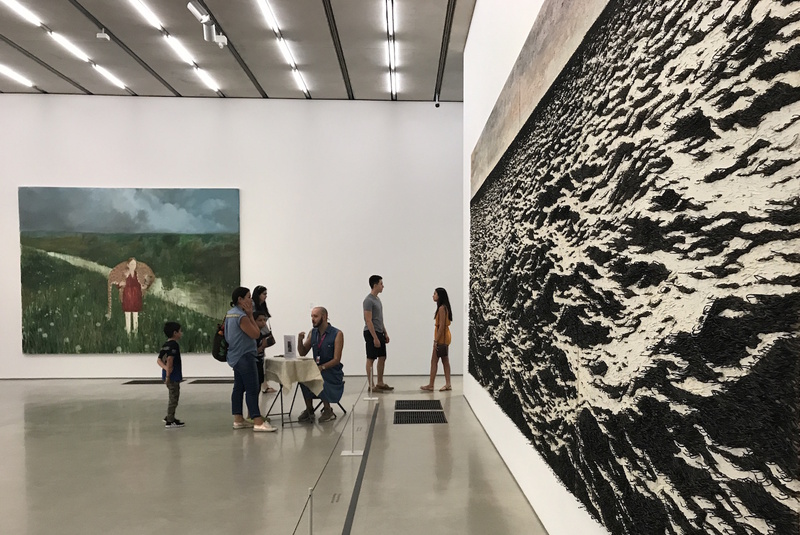 He sat next to Island (sea-escape), a massive painting by Cuban artist Yoan Capote depicting a vast and roiling ocean of black waves tipped with white foam. Like a Vija Celmins seascape on steroids, the painting offers a high contrast vision of an escape from Cuba where the journey can end happily, with an eventual sighting of land and freedom, or with the churning black waves overpowering you, as you sink to your death. Both these scenarios are plausible given the magnitude of the piece and the consistency of the vision. 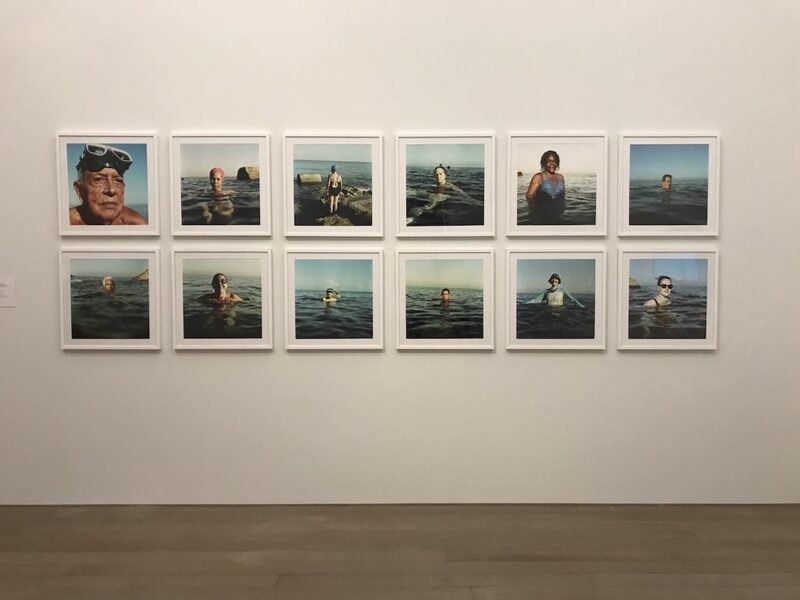 Instead of paint, as I had originally assumed, Capote had used thousands of black metal fishhooks to build up a three-dimensional surface, which coalesced into a photorealist window to the sea. At a micro level, the glinting points suggest terror, violence, and also the determination needed to make such a dangerous voyage, but in a visceral way that would have been insufficient had it been rendered in paint. This interaction with the teaching artist in the gallery flicked on a light bulb in my brain and I felt the power of the work, as well as empathy for the artist who created it. Suddenly the piece was poignant and personal. The artists’ own small woven creation, being formed at the small table, reinforced Capote’s process of building a layered relief. A young family queued up behind me at the artist’s desk, so I moved on, but with a feeling of excitement about the encounter. Art has the ability to impact our ideas and emotions, even our bodily sensations, to make us feel a connection with the larger world, and to expand the ideas and experiences we hold inside, but the personal interaction with a PAMM teaching artist to prompt my thinking was necessary in creating affinity with the art. Consider the typical docent experience. Museums usually don’t pay their docents to give tours and interact with the public, so they must be volunteers. Who can afford to do this work? Wealthy retired folks. By not paying those who interact on the front lines, museums immediately set up an age and class conflict between audience and institution. But what if museums actually paid artists full-time to engage with audience, talk about the work in a personal and maker-centric way, teach classes, encourage and answer questions, plan creative programming, and build a sense of authentic hospitality? 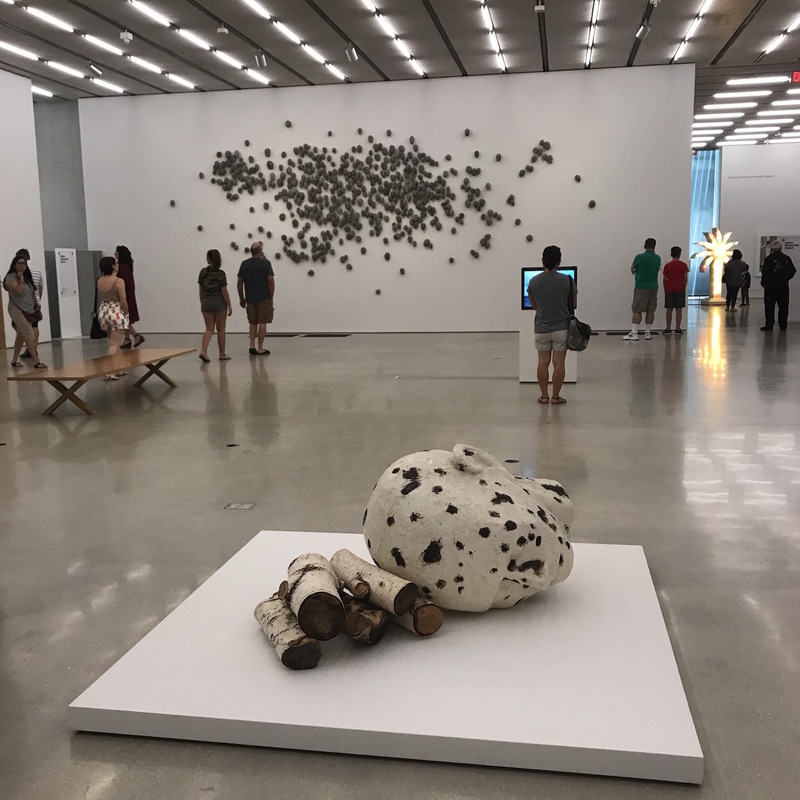 Although few museums seem to realize it, PAMM has enacted a revolutionary and forward thinking shift in museum culture: great art is essential, but the physical presence of contemporary artists is equally essential in building a meaningful museum experience. While most collecting institutions assume that the quality of their artwork, and even protecting that artwork from the audience, is their most important role, their emphasis on objects over human interaction actually makes for an unpleasant, or at least less optimal, experience. Great art is essential, but the physical presence of contemporary artists is equally essential in building a meaningful museum experience. 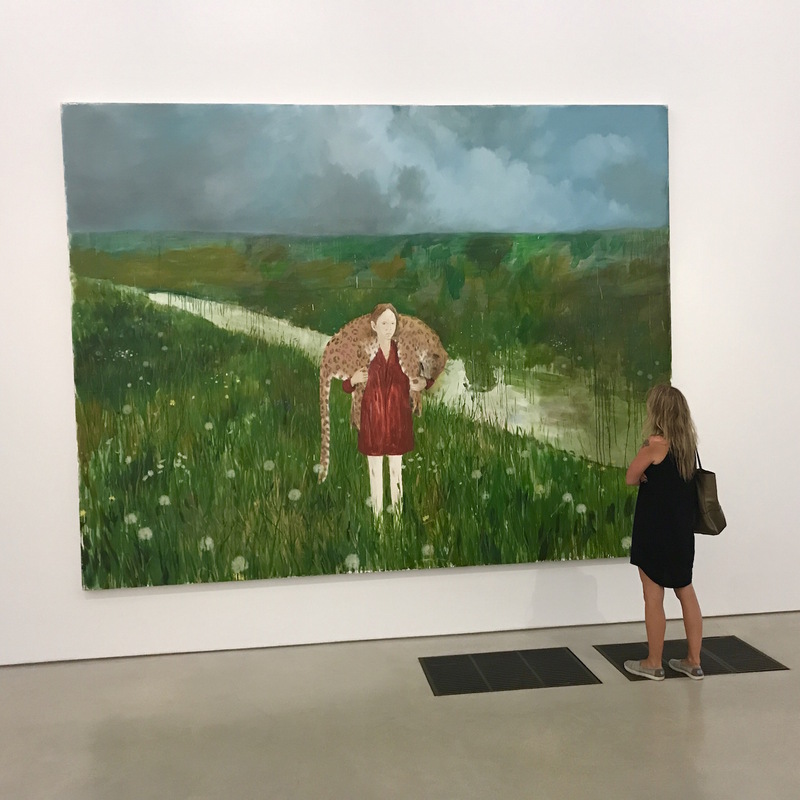 Had the teaching artist not been present in the gallery at PAMM, I would have looked at the painting for a few seconds and appreciated its size, but missed out on a deeper connection with the piece. Even more than the piece of art, it was my interaction with the artist in the gallery that made me feel at ease and welcome there, making me want to return in the future. Throughout the museum, I observed other artists creating opportunities for visitors to interact in physical and personal ways. There were artists in upstairs galleries talking to patrons and answering questions. There were artists setting up a drawing activity with color-coordinated buckets of crayons in a multi-use space used as a wide staircase, an informal theater, and a classroom. 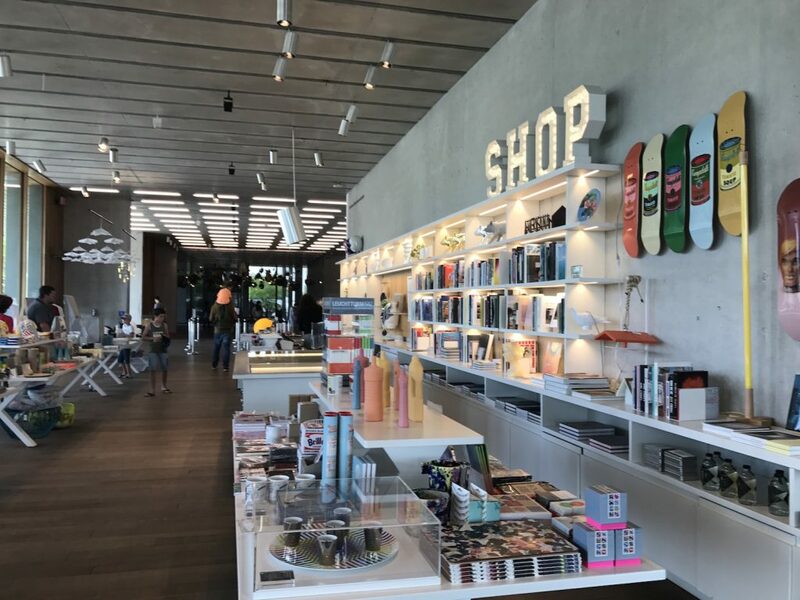 Even the gift shop at PAMM is curated by a contemporary visual artist, an open and color-coordinated space where decadent coffee table art books sat next to art-themed skate decks, kids’ toys, and locally screened T-shirts. Although the Pérez Art Museum is a stunning, new building (circa 2013) designed by Pritzker Prize-winning architects Herzog & de Meuron and placed dramatically on waterfront property, I found myself most intrigued by its friendliness and stylish comfort. The aesthetics of design, architecture, and art are definitely cutting-edge and present a challenge to the viewer, but the place exudes warmth, suggesting that the people working there, and their collective sense of ownership, make it truly special. We all know that the purpose of collecting institutions has long been archival and historical; it’s their job to select and care for the most significant objects made in our time and to preserve them for future generations. However, this emphasis on protecting the precious collection – often from those who show up to experience it – is a tragic stumbling block. A lack of hospitality, an aggressive security guard’s watch, a docent who cannot connect with young people, harassment for taking photographs, a sudden blare of an alarm if you stand too close—these negative reinforcements are sadly typical of museum culture. It’s not easy to visit a museum. 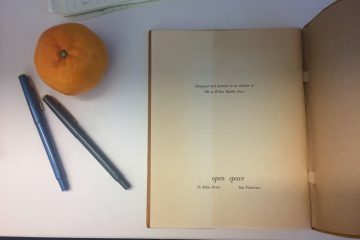 There’s travel, parking, entrance fees, the heavy-handed suggestion to stow your bag or backpack in a locker, the insistence on giving up food or drink, not carrying the wrong writing utensil, not standing too close to the art. After all this effort on the part of a visitor, even one negative experience makes a return trip unlikely. 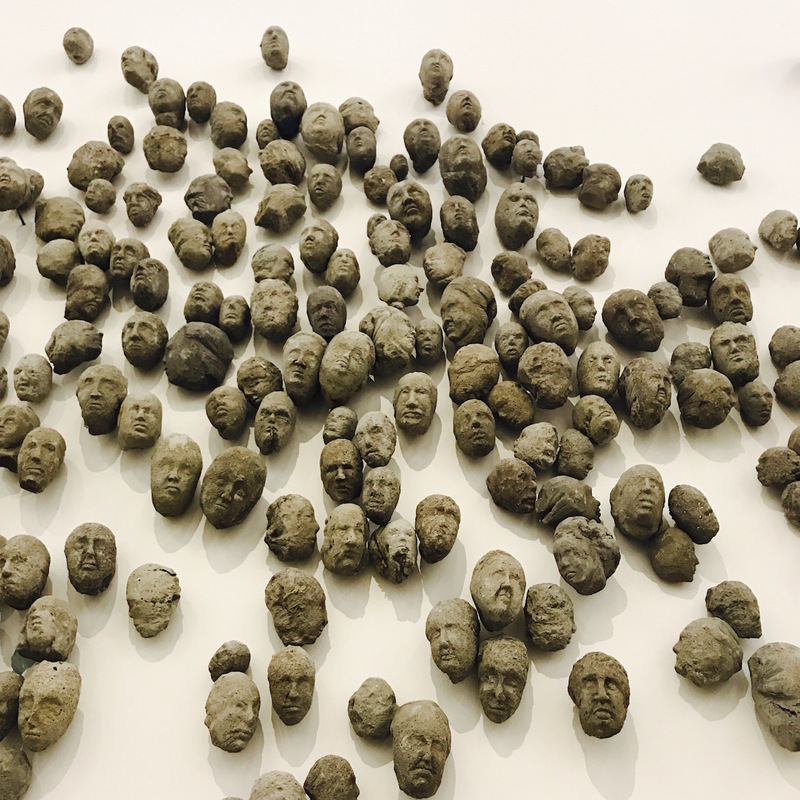 Art museums should do everything possible to make people feel welcome, but most are still more focused on the art in their collections than the human beings who have come to interact with it. 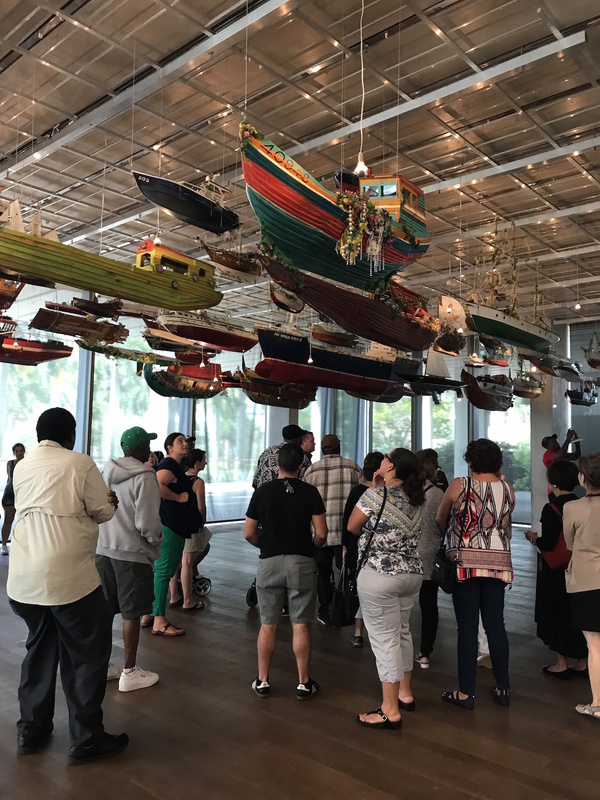 PAMM feels different; and it explicitly states that its mission is to improve the quality of life in the local community, to engage with art and human beings as social creatures, and to build relationships between people and art. This emphasis on humans is nothing short of revolutionary. According to Mikhaile Solomon, a Miami resident and founder of Prizm Art Fair reached by phone, “Perez has been able to contradict many of the elitist systems that other museums seem to have by facilitating more community engaged relationships.” She acknowledged that PAMM’s current incarnation is just five years old, after previously being known as The Miami Art Museum, but it’s transformation was ground-breaking. She said that, before its reinvention in a new building, the museum had been formal, small and dismal, hard to access, with weak programming and hit or miss exhibitions. 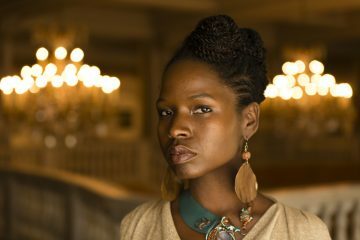 “Now, the shows are consistently compelling, and they have great events and a fantastic restaurant,” she said with enthusiasm. A value placed on local artists, as well as internationally known artists, sets PAMM apart from most contemporary museums who exclusively show international names with the misguided assumption that global relevance and blue chip standards will attract a local audience. This practice actually alienates regional museums from their most loyal and passionate visitor base, the local contemporary art community, assuming that local artists aren’t worthy of exhibition alongside international ones and that they aren’t sophisticated enough to recognize the bias. 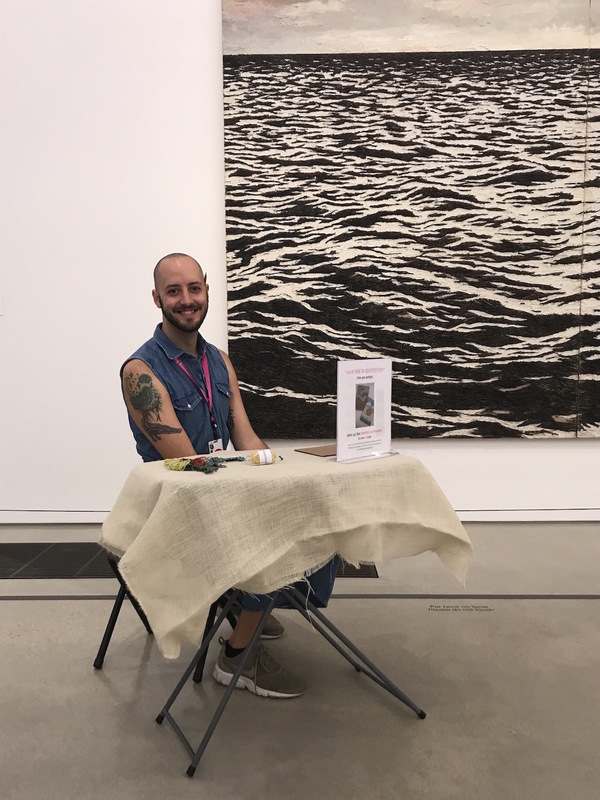 Even when local artists are included in exhibits at most museums, they are typically smaller shows in less than desirable gallery spaces, effectively using local artists as bait in an attempt to capture a local audience without committing resources to it. 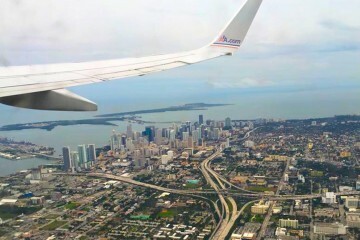 Citing Ed Ruscha’s first major public commission in a Miami public library in 1995, and Christo’s Surrounded Islands from 1983, Sirmans explained that Miami has embraced the idea that art is for the public and should be made available in public places and collected by public institutions. Running a contemporary art museum that manages to straddle the divide between local and international agendas is complicated. 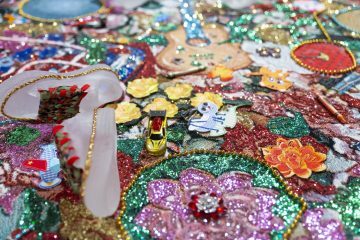 It becomes even more intricate with the inclusion of local contemporary artists as full-time employees, as well as programming designed specifically to attract a diverse audience and to promote community equity. 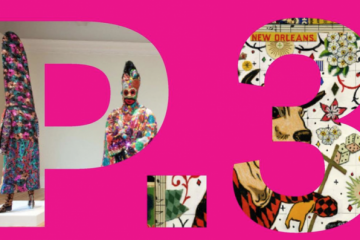 PAMM’s public programming, which includes the placement of high quality reproductions of its contemporary art in public parks and outdoor spaces, a robust publication and social media presence, all sorts of social events, and the museum’s Teaching Artists Initiative all come together to play a critical role in helping to create a place for artists to live and make work. And their audience is growing. The takeaway? Other museums should pay attention to PAMM. The model of museum as cultural gatekeeper, held hostage by intellectual superiority, the priorities of a few wealthy board members, and a hierarchical approach to art history is dooming institutions to irrelevance. 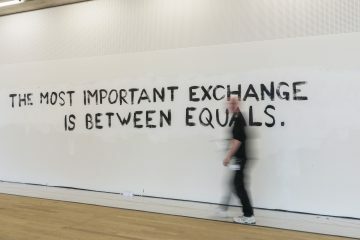 Replaced instead with an attitude of hospitality, where humans are valued more than art objects, and understanding that the local community of contemporary artists should be viewed as an asset rather than a liability, museums have the potential to evolve and become a vital part of cultural life. Who better to facilitate these interactions than contemporary artists? 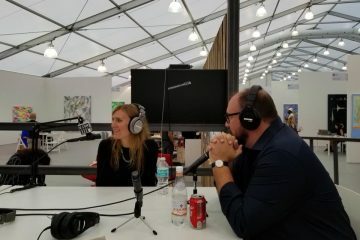 Artists bring a fresh perspective to the conversation around contemporary art; they offer constant questioning, the ability to discuss art as a living object rather than a historical footnote, and a willingness to consider different ideas and opinions. Without artists, a museum is nothing more than a beautiful mausoleum for remembering the dead, rather than a living space for enriching our collective experience. Photos by Cara Ober in August, 2017. 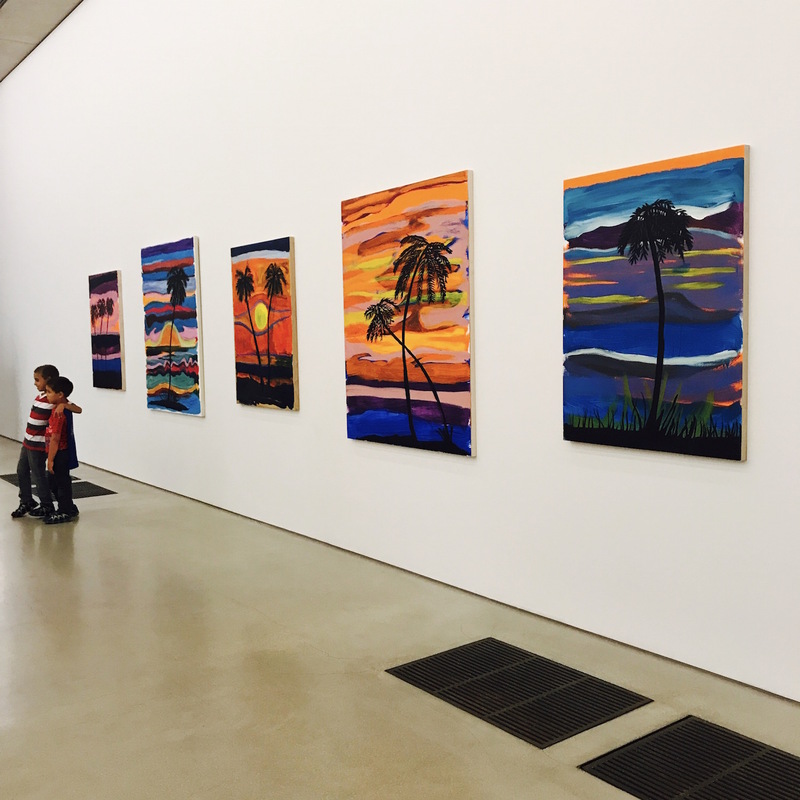 She is looking forward to visiting PAMM again in December during Art Basel Miami Beach week! Terrific article and concept. 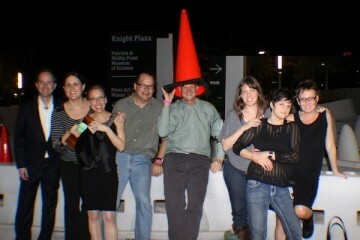 Just had a docent tour of photography at the Hirschhorn. Why not a photographer or artist? So much better!